The 300th anniversary of one of the key battles in British history is to be marked by a week of events. The Battle of Blenheim saw John Churchill, the 1st Duke of Marlborough, defeat the French army of Louis XIV on 13 August 1704. 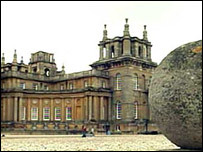 Blenheim Palace in Oxfordshire was built by order of Queen Anne to thank Marlborough for his victory. On Friday, the present Duke will dress as his famous ancestor to celebrate the anniversary at the palace. The public event will include a mock battle, and air displays by the RAF Falcons parachute team, with money raised going to the Soldiers', Sailors' and Airmen's Families Association (SSAFA). From Wednesday to Sunday, the first 300 visitors to the John Churchill exhibition currently on at Blenheim will receive a commemorative coin. The decisive victory by Marlborough inflicted a first-ever defeat on Louis XIV and paved the way for three other great Marlborough battle successes between 1706 and 1709. One hundred and seventy years after Marlborough's first great victory, his descendant Winston Churchill was born at Blenheim.